Announcement Welcome to our new shop! Keep checking back for more Charlotte Mason inspired homeschooling resources! Welcome to our new shop! Keep checking back for more Charlotte Mason inspired homeschooling resources! 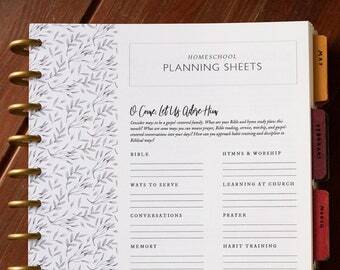 Simple but beautiful that has all the sections I needed to plan our Charlotte Mason homeschool day. If you're here from Instagram, welcome! I've been blown away by how many of you have expressed interest in my monthly homeschool planning pages! Thanks for supporting my shop! Please note--all items are digital downloads, which you print yourself. No physical products will be shipped. Since these are digital downloads, all sales are final.